Vidkun Abraham Lauritz Jonssøn Quisling (Norwegian: [ˈvidkʉn ˈkvisliŋ] ( listen); 18 July 1887 – 24 October 1945) was a Norwegian military officer and politician who nominally headed the government of Norway after the country was occupied by Nazi Germany during World War II. 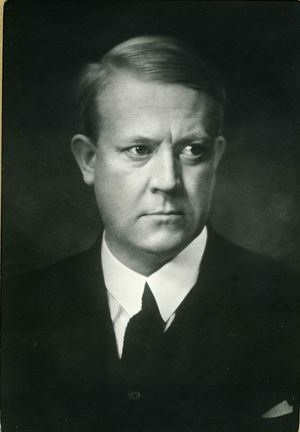 Quisling first came to international prominence as a close collaborator of Fridtjof Nansen, organizing humanitarian relief during the Russian famine of 1921 in Povolzhye. He was posted as a Norwegian diplomat to the Soviet Union, and for some time also managed British diplomatic affairs there. He returned to Norway in 1929, and served as Minister of Defence in the governments of Peder Kolstad (1931–32) and Jens Hundseid (1932–33), representing the Farmers' Party. In 1933, Quisling left the Farmers' Party and founded the fascist party Nasjonal Samling. Although he achieved some popularity after his attacks on the political left, his party failed to win any seats in the Storting and by 1940 it was still little more than peripheral. On 9 April 1940, with the German invasion of Norway in progress, he attempted to seize power in the world's first radio-broadcast coup d'état, but failed after the Germans refused to support his government. From 1942 to 1945 he served as Prime Minister of Norway, heading the Norwegian state administration jointly with the German civilian administrator Josef Terboven. His pro-Nazi puppet government, known as the Quisling regime, was dominated by ministers from Nasjonal Samling. The collaborationist government participated in Germany's genocidal Final Solution. Quisling was put on trial during the legal purge in Norway after World War II: he was found guilty of charges including embezzlement, murder and high treason against the Norwegian state, and was sentenced to death. He was executed by firing squad at Akershus Fortress, Oslo, on 24 October 1945. The word "quisling" has since become a byword for "collaborator" or "traitor" in several languages, reflecting the very poor light in which Quisling's actions were seen (both at the time and since his death). Block, Maxine, ed. (1940). Current Biography Yearbook. New York, United States: H. W. Wilson. Cohen, Maynard M. (2000). A stand against tyranny: Norway's physicians and the Nazis. Detroit, United States: Wayne State University Press. ISBN 978-0-8143-2934-4. Dahl, Hans Fredrik (1999). Quisling: A Study in Treachery. Stanton-Ife, Anne-Marie (trans.). Cambridge, United Kingdom: Cambridge University Press. ISBN 0-521-49697-7. Galtung, Johan (1997). "Is There a Therapy for Pathological Cosmologies?". In Turpin, Jennifer E.; Kurtz, Lester R. The Web of Violence: from interpersonal to global. Champaign, United States: University of Illinois Press. ISBN 0-252-06561-1. Hayes, Paul M. (1966). "Quisling's Political Ideas". Journal of Contemporary History. 1 (1): 145–157. doi:10.1177/002200946600100109. JSTOR 259653. Hayes, Paul M. (1971). Quisling: the career and political ideas of Vidkun Quisling, 1887–1945. Newton Abbot, United Kingdom: David & Charles. OCLC 320725. Høidal, Oddvar K. (1989). Quisling: A study in treason. Oslo, Norway: Universitetsforlaget. ISBN 82-00-18400-5. Yourieff, Alexandra Andreevna Voronine; Yourieff, W. George; Seaver, Kirsten A. (2007). In Quisling's shadow: the memoirs of Vidkun Quisling's first wife, Alexandra. Stanford, United States: Hoover Institution Press. ISBN 978-0-8179-4832-0.